In 1862, a federal staff officer asked President Abraham Lincoln about the incessant stream of visitors to his office. Why, the officer wondered, didn’t Lincoln have clerks screen his visitors and restrict the traffic? As a historian, I like to think of my own forays into the world of popular audiences as my public history baths. Although mine are less frequent than Lincoln’s, they accomplish many of the same ends. They “renovate and invigorate” my understanding of the public’s interests, and they keep me in touch with “the great popular assemblage” to which I look forward to returning full-time once I finish my Ph.D. I took an extended public history bath this summer. 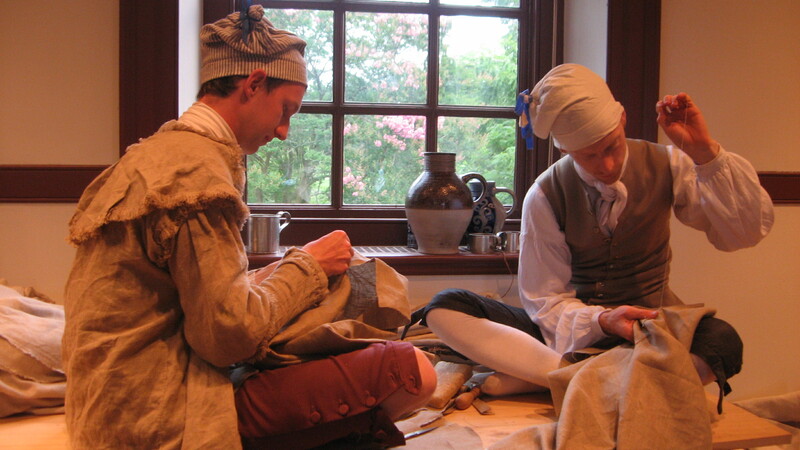 As a historic trades intern at Colonial Williamsburg, I participated in the “First Oval Office Project,” a cooperative initiative between Williamsburg and the Museum of the American Revolution to recreate, using historically accurate materials and hand-sewing techniques, George Washington’s Revolutionary War campaign tent. Rather than complete this work in a warehouse behind closed doors, we executed it in the Secretary’s Office, one of Williamsburg’s original buildings, dating to 1747. Our doors, like Lincoln’s, were always open. A typical view inside the Secretary’s Office, Colonial Williamsburg, Summer 2013. My conversations with visitors varied greatly. 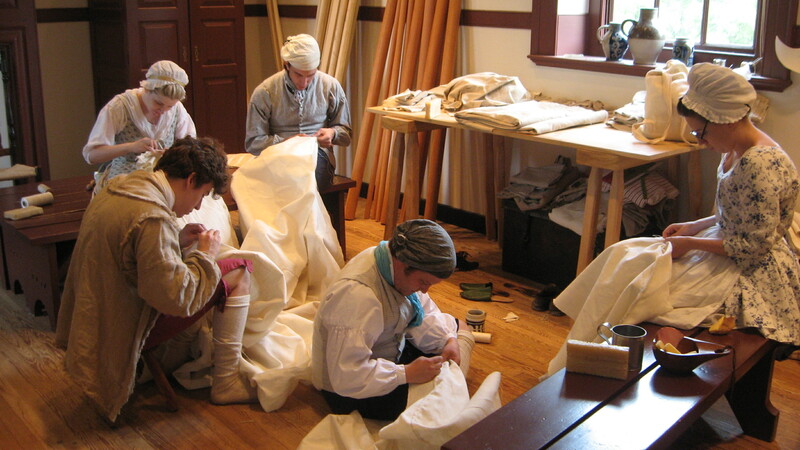 When not sewing, I acted as a third person interpreter, meaning that I wore historical clothing but did not assume any sort of historical character. I had many conversations about linen weaving, hand sewing, and sleeping under a canvas tent. The regularity of questions like “how was the tent waterproofed?” might have become trying, but, instead, we took it as a challenge to devise creative new answers to common inquiries. Tyler Rudd Putman and Joseph Privott at work on the First Oval Office Project. All of these conversations reminded me why I study history in the first place. Working as an interpreter at a historic site is not so different from being any other type of interpreter, including a linguistic one. You straddle two worlds. Rather than facing linguistic barriers, the historical interpreter faces temporal ones. You need to take the events of the past and translate them into a language and narrative comprehensible to a contemporary audience. In fact, that’s what all historians do, albeit sometimes for students and scholars in traditional academic settings. Of course, not all University learning happens in a traditional classroom, either. 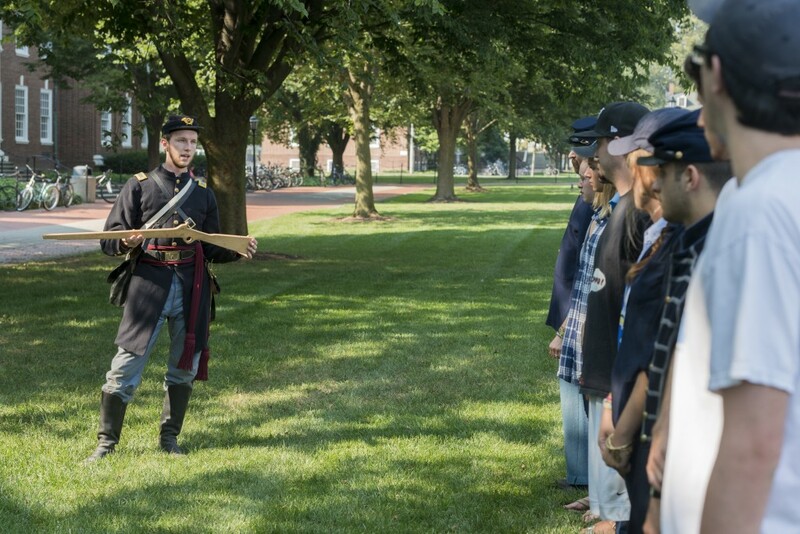 A few weeks ago, Lucas Clawson, a University of Delaware Ph.D. candidate and reference archivist at Hagley Museum and Library, and I arrived on the University green one afternoon dressed as Civil War soldiers. We spent the next hour introducing students in Professor J. Ritchie Garrison’s upper-level undergraduate history class, “The Emancipation Project,” to the rudiments of Civil War drill and material culture. These students could read about Civil War maneuvers for weeks, but they would still lack a certain experiential understanding of the subject. But when you stand in line at the position of the soldier and learn the face right or left, to double or undouble files, to march forward and by file right and left, to march by the flank, and to wheel right or left, something about the Civil War crystallizes in your mind. How officers took completely inexperienced recruits and quickly introduce them to linear drill begins to make sense. You realize how, after months of rote training, these same soldiers reacted instinctively to commands given even during intense fighting. You understand why Civil War soldiers stood in lines at all (it was for coordinated movements and to mass, or concentrate, their relatively inaccurate fire) and why such tactics proved so devastating as the war progressed (because rifled musket technology and accuracy advanced faster than field tactics). Perhaps, you catch a glimpse of the unity that emerged among soldiers on and off the battlefield. In the case of the 54th Massachusetts Volunteer Infantry, a regiment of African Americans and the focus of Professor Garrison’s class, drill and battlefield performance proved the competence and strategic value of black troops, who helped swing the war in the North’s favor. Discussing Civil War drill with University of Delaware undergraduates. Photo Credit: University of Delaware/Evan Krape, 2013. My public history baths aren’t just about educating the public. Far from it. In fact, I usually feel that I take away as much or more than my audience. At Williamsburg, I learned how to articulate complex historical narratives of race, gender, class, labor, technology, and ideology in ways that made sense to nonacademic visitors. When that visitor asked me about when American became a good place for poor people, I responded by discussing how our definitions of equality and freedom change over time. I invoked Gordon Wood’s The Radicalism of the American Revolution (1992), without ever naming the book, when I pointed to how the Revolution expanded the rights of free white men in particular. I gave a nod to the historiographical debates surrounding Wood’s work when I suggested that this same expansion of freedom came at the expense of others, such as women, and may not have been quite as positive as we sometimes think. Our definitions of freedom are still changing, I suggested, and our revolution continues. Public interpretation lets you condense complex historical arguments and provides a rocky and unpredictable proving ground on which to test the effectiveness of various historians’ answers to perennial questions. In the case of the Civil War drill, the students may have learned a lot about moving like soldiers. I’ve studied Civil War drill for years and executed it as a living historian and volunteer at a variety of historical sites. But with this class, I learned what it’s like to take a group of completely novice individuals, with no more experience of linear drill than the average recruit of 1861, and put them through the paces of military maneuvers. I was genuinely surprised just how quickly they picked up the basics, even with only two instructors to a dozen students. I firmly believe that all historians should take regular public history baths. This doesn’t have to involve months of costumed interpretation or complicated military drill. It can be as simple as giving a talk at your local historical society, elementary school, or fraternal club, maintaining an accessibly-written blog, or publishing in a public history periodical. Like it or not (I like it), we all return regularly to the great popular assemblage from which we sprang, and it’s good to test the water there once-in-a-while. It can get pretty cold in the ivory tower, but the water of public history is always warm. *Miles O’Reilly [Charles G. Halpine], Baked Meats of the Funeral (New York, Carleton, 1866), 106. About the author: Tyler Rudd Putman is Ph.D. student in the History of American Civilization Program. He maintains a blog at www.ranawayfromthesubscriber.blogspot.com. This entry was posted in living history, Methodology, Outreach, Pedagogy, public humanities, Teaching and tagged Civil War, Colonial Williamsburg, Emancipation Project, First Oval Office, Museum of the American Revolution, Revolutionary War by Tyler R Putman. Bookmark the permalink.